In hindsight, giving one of the more irritating foes from Ghosts ‘N Goblins its own spinoff may not have been the smartest marketing choice for Capcom, but the winged protagonist Firebrand earns his keep in this difficult and crafty fantasy adventure. Beyond a reputation for being brutal in the challenge department, Gargoyle’s Quest stands out for its interesting blend of RPG exploration and action-focused platforming. It’s a tough quest at moments, but the unusual formula works well. A hellish army of invading “Destroyers” led by the evil King Breager aims to annihilate the ghoul realm, and you’re the villain-turned-hero tasked with stopping the onslaught. Exploration occurs from a top-down view where you’ll roam the map, interact with NPCs in towns, and take on quests to progress the story. It has a classic RPG vibe, but the action kicks into high gear with the game’s random and not-so-random encounters. 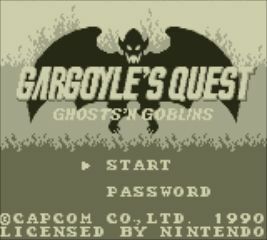 Running into foes triggers side-scrolling platform stages, which is where Gargoyle’s Quest shines. Firebrand can cling to the sides of walls, hover in mid-air for a brief moment, and shoot fire to dispatch adversaries. His powers get beefed-up as you progress, and the challenging platforming level design puts your abilities to the test. Without the 3DS’ much-appreciated option to create a restore point, the difficulty would be too frustrating to sit through, since you have to start over from the very beginning if you die twice. Certain items extend that slightly, but the 3DS’ safety net stretches out the fun and playability enough to let you enjoy the adventure as it unfolds.